Peterhead came back from an early Clyde goal to take all three points at Broadwood Stadium with a 4-1 win over the Bully Wee. Clyde were unchanged from the side that beat Keith 3-0 at Kynoch Park while Peterhead swapped in Russel McLean for Simon Ferry following their 9-0 win over Colville Park with the former Dundee man dropping to the bench. Peterhead threatened first on six minutes when Jamie Stevenson wrapped his right foot round a 25 yard free kick which went just wide of the near post. Peterhead almost took the lead two minutes later when Willie Gibson’s corner was met by Jason Brown at the back post who headed across the face of goal to Russel McLean who stabbed a shot at goal from six yards which was cleared off the line by Jordan Stewart. 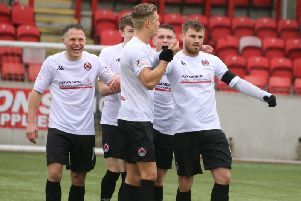 Clyde took the lead on 12 minutes when a Smart Osadolor shot from inside the box was parried by Fleming in to the path of Darren Ramsay who blasted the ball in to the roof of the net from close range. Peterhead won a free kick on half way on 28 minutes and the ball in to the box was cleared only as far as Gibson who played it straight back in where Jason Brown got a touch at the near post which seemed to deceive Currie in the Clyde goal leaving Smith with the easiest of finishes despite pressure from the home defenders. Clyde looked to get back and were denied on 30 minutes by a fine save from Fleming who parried Godwillie’s effort from 10 yards after the ball fell kindly to the former Aberdeen striker. Jack Leitch struck a powerful shot from 20 yards which flew narrowly over the bar on 34 minutes. Rory McAllister should have put Peterhead 2-1 ahead on 37 minutes when he got on the end of a McLean header but his half volley on the right foot curled round the far post. David Goodwillie got the first chance of the second half with a audacious over head kick that deflected off a Peterhead defender after three minutes. Peterhead then forced a good save from Currie as Stevenson struck a free kick from a similar position to his first half effort and this time the ball was heading straight for the top corner before the keeper got a glove on it to tip it over. Peterhead took the lead on 64 minutes when Jack Leitch played the ball wide to McAllister who took it to the by-line and cut back to Leitch in the centre who side footed it in to the back of the net from 10 yards. It was 3-1 just one minute later, Peterhead won the ball back after the kick off and Russel McLean opted to shoot at goal from 30 yards and what a strike it was as the ball went screaming past Currie in the Clyde goal. Rory McAllister then put the game beyond the Bully Wee on 75 minutes, McLean playing the ball across goal and Currie getting a hand on it but the keeper should have done better and held the ball but instead fisted it in to the path of the Peterhead Striker who rifled it in to the top corner.